The public cloud model is the most recognized model of cloud computing to several consumers that offers services in a virtualized environment. The pool of shared physical resources is used to build the physical resources and the environment can be accessed over a public network that is internet. 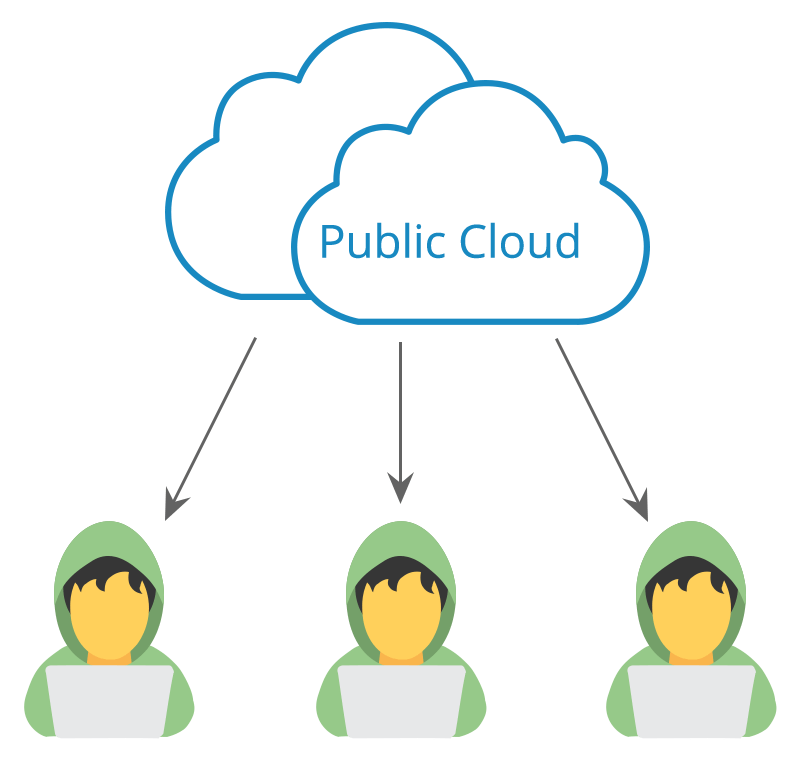 Public cloud is similar to a private cloud where the pool of underlying computing resources is restricted and creates a distinct cloud platform that is accessible to only a single organization. Services are offered to multiple clients with the same shared infrastructure. Private individuals that require low level of infrastructure and security used public cloud extensively. Enterprises too can use public cloud as it makes their operations more efficient. For example, they can store non-sensitive content, webmail and online document collaboration. Public cloud comprises of vast pools of resource that make cloud resources available on demand for the seamless response of applications running on them to the activity fluctuations. Greater levels of resource are made available by public clouds and so, businesses can benefit largely in terms of cost from scalability feature of the cloud. The underlying infrastructure is shared across all the consequent cloud services while the components, such as server, need less modified configuration, the public cloud service can be implemented at very less cost in comparison to private cloud. Public cloud services implement the pay-as-you-go model and so, consumers are able to access the resources whenever required and pay only for the used ones. The total number of servers and networks for creating a public cloud and the redundancy configurations indicate that if one physical component fails, the cloud service will continue to run without any issue on the other components available. There are several services such as IaaS, PaaS and SaaS available in the market that are based on the public cloud model and ready to be accessible via any internet enabled device. Almost all computing requirements are fulfilled by the public cloud and can be beneficial to private as well as enterprise clients. Since the public cloud service is available via internet connection, client located at any place is able to access it. This gives any enterprise the significant opportunities such as online document collaboration from multiple locations or remote access to IT infrastructure. Public cloud is one of the simplest of all cloud deployments. When a client requires more resources, platforms or service, he just signs up with the public cloud vendor and gets an access to required resources whenever required. The storage isn’t owned by the client but simply their data is backed up. Also, clients don’t have to manage server operations and don’t need to check, if their cloud-based platforms, services or applications are secure or maintained. This is because everything is handled by the cloud vendors. The public cloud users only make an agreement, use the resources and pay only for what is used within certain amount of time. Fully Managed DigitalOcean hosting for your websites and apps. Fully Managed AWS hosting for your websites and apps. Cloud platform for Developers with built-in DevOps tools.